Lieutenant Colonel (?) 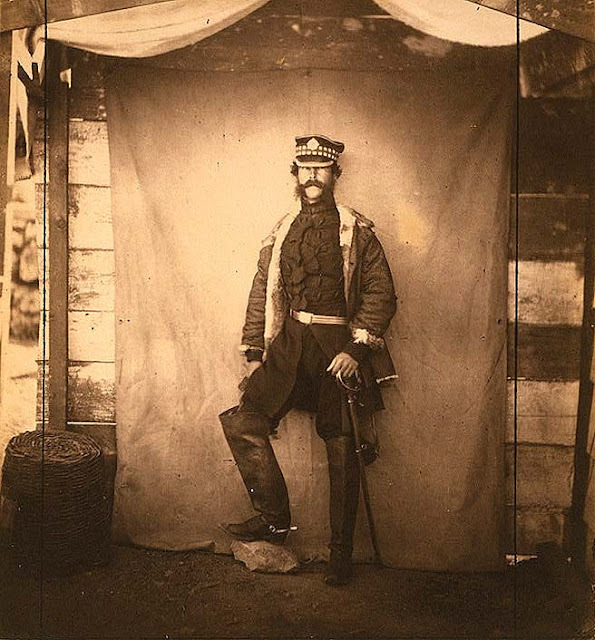 Francis Seymour, Fusilier Guards, Crimean War. Photo made by Roger Fenton, 1855. Amazing photo, and thanks for the wiki link - an interesting read, especially that his son was born when he was aged 74!!! Oh, I didn't notice that piece of info. And there I was thinking Paul McCartney is an old dad. I'd like to introduce him to some single ladies of the time. Well, they look single in the photos. Can't be sure. A handsome fellow, and there was something about the rakish angle of his cap! Fathering his only male heir when he was 74 as well. He was so dashing in his military uniform. I'm sure he made the ladies swoon!